The Xperia Z smartphone was deemed by CNET at the Consumer Electronics Show (CES) earlier this year to be one of the top smartphones of 2013. At that time, the Japanese manufacturer sported its waterproof smartphone and seemed to have a healthy confidence about the company’s turnaround. The company confidence was only exceeded by the Xperia Z judges, who gave the Sony smartphone ten awards and two honorable mentions at one of the most important conferences of the year (behind Mobile World Congress). Sony has released other Xperia Z smartphones since then (the ZL and possibly a future phone named “ZR”), but the Xperia Z remains the catalyst that started what many analysts believe will be a Sony comeback in the tech market. As with many non-American manufacturers, quality smartphones produced often take months to arrive in the States. Samsung smartphones, while extremely popular both here and in Europe, for example, arrive in Europe months ahead of their debut in the US. When Sony first announced its water and dust-resistant smartphone back in January, but was not released globally until March 1st, the common assumption in the US was that Sony’s smartphone would arrive in America no earlier than the end of May/early June (and possibly as late in the summer as July). Fortunately, the Xperia Z arrived in the US this week and is now available for purchase. Why Invest in the Unlocked Sony Xperia Z Smartphone? The Xperia Z has many specs that are in line with 2013 standards: a five-inch display, 1920 x 1080p screen resolution, 13-megapixel camera, 2GB of RAM, and a Qualcomm, 1.5Ghz Snapdragon S4 Pro processor. The handset also runs Android 4.1 Jelly Bean, although Sony recently promised an upgrade to Android 4.2 Jelly Bean right after the device was released. There has been no word on the 4.2 update as of now. The Xperia Z’s HSPA+ only network for now, however, is a drawback to purchasing the phone outright from Sony or any other electronics manufacturer that sells the device. A 4G LTE model is headed to T-Mobile, so LTE lovers will have a chance to get the device if they are willing to wait a little longer for its arrival. 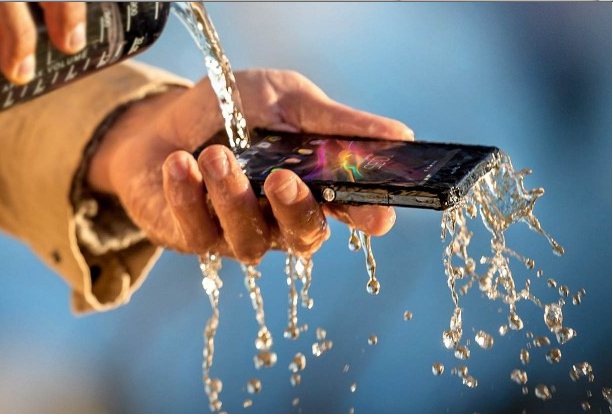 The water and dust-resistance technology used on the Xperia Z makes the phone a must-have, seeing that water and dirt are two elements that lead to the death of our most coveted electronic gadgets. Some tech writers joke about the necessity of these, but anyone who has taken his or her phone for a summer swim while forgetting to take the smartphone out-of-pocket will understand completely. The Xperia Z is one of Sony’s “powerhouse” smartphones, and its price packs one heck of a punch. When the Xperia Z first appeared on Sony’s website for sale, it was priced at $759.99 — and its price point was considered to be one of the phone’s drawbacks. The Z smartphone now sells for $629.99 at the Sony site, saving you $130 off of the original price. While $629.99 ain’t bad for a water and dust-resistant smartphone, the Xperia Z has a greater price drop than $630. Newegg and Amazon are two places that give you more phone for your buck. Newegg (http://www.newegg.com/Product/Product.aspx?Item=N82E16875212248) lists the Xperia Z in purple or white for $599, while the black Z will cost you the current price at the Sony site ($629.99). Amazon (http://www.amazon.com/gp/aw/d/B00C7ATZMK/ref=redir_mdp_mobile?keywords=xperia&m=ATVPDKIKX0DER&qid=1367773991&ref_=sr_1_6&s=wireless&sr=1-6), on the other hand, offers the best price and color preferences: for $599, you can purchase the unlocked Xperia Z in either black or white, with the LTE + HSPA version costing you less than the unlocked, HSPA+ versions ($589 vs. $599, respectively at Amazon). If the choice comes down to LTE and HSPA for less than HSPA+ only, the LTE handset takes the prize. Although you can get the Xperia Z for an affordable price at Amazon, you may have a reason to wait until it arrives at your prepaid carrier. T-Mobile just saw its Xperia Z with LTE gain approval from the Federal Communications Commission (FCC) as of May 1st (http://reviews.cnet.com/8301-19736_7-57582375-251/t-mobile-bound-sony-xperia-z-clears-the-fcc/), and T-Mobile’s “UNcarrier” smartphones are priced affordably. T-Mobile’s smartphones have what unlocked smartphones do not: the AWS band that gives you access to its 2100MHz cell radio frequency. Factory unlocked smartphones do not provide the AWS cell band that you need to use T-Mo’s network. Thus, it may profit you best to wait until the smartphone arrives at T-Mobile. The Xperia Z did not win all those awards at CES without reason. Apart from its specs and pricing, the “Z” comes as an unlocked smartphone. For those who may not know, unlocked smartphones arrive without being tied to a specific carrier (such as AT&T, Verizon, etc.) and can be used overseas with the purchase of a local SIM card in the country in which you travel. Unlocked phones are referred to as “GSM” phones (global system for mobile communications). GSM phones, however, can be used on prepaid or pay-as-you-go plans and do not come with contract fees or a two-year time frame. In other words, GSM phones on prepaid plans allow you to leave a phone agreement when you want. In the United States, there are two major GSM carriers for unlocked smartphones, AT&T and T-Mobile, with mobile virtual network operators (or MVNOs) as minor carriers. AT&T has Straight Talk and Net 10 as some of its network operators, with a new network operator (All In One) scheduled to appear next month. Rumors state that AT&T will offer data plans as low as $35 a month for feature phones (flip phones) as well as a minimum $50 monthly plan for smartphones that provides unlimited voice and text with only 2GB of data. There may even be a $70 monthly plan available for smartphone users, but it will only offer 5GB of data. T-Mobile, the other major GSM carrier, continues to offer low, affordable smartphone plans as low as $30 a month. The “UNcarrier’s” new value plans come with unlimited voice and text, but T-Mo’s prepaid plans are still the most popular. For $70 a month, T-Mobile offers truly, unlimited 4G data, a stark contrast to AT&T’s 5GB of LTE data. The one disadvantage with T-Mobile right now is that its LTE network has only been turned on in seven cities (Baltimore, Houston, and New Orleans, among others). T-Mobile looks to expand its LTE network to 100 million customers by year’s end, though we have no idea which cities are next in line to receive LTE. For those of you that do not have access to a T-Mobile store but want to use T-Mo’s network, its virtual network operator Solavei just opened earlier this year and even offers the Xperia Z as a compatible smartphone. Are you thinking about getting the Sony Xperia Z as your next smartphone? Let us know in the comments below.